Sometimes a piece, be it an animated cartoon or a comic is saved by the execution, by something that happens after the writing and most of the planning is done. This is one of them. The joke in this comic is pretty good, but I think it's really the baby that makes it funny. As you can see, I did a few versions of him. I was immediately not happy with his appearance when I drew him (see drawing 1). He wasn't really in the same style as the other characters and he was also kind of ugly. The subsequent trials can be seen in drawing 2. For the final I flipped the left most drawing on # 2 horizontally and put it in place of the original. The shape of his head is nice and he's got cute big eyes. The other funny thing is that Mom and Baby were sympatico - both have similar expressions and angry dark clouds over their heads. And then there's the droll! In my opinion, that's really the funniest part - he looks so ticked but has this ridiculous slime trail going down his gob. Here's a close up of Mom and the gipper. By the way, Mr. I.G... the baby? That's you! HA! 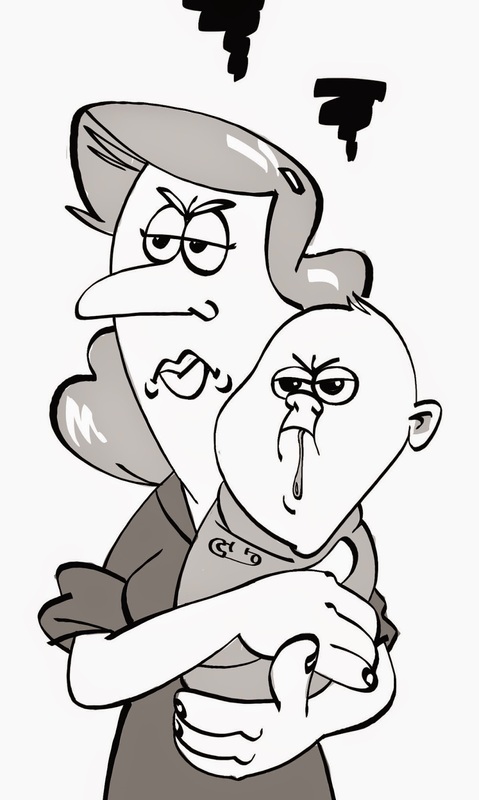 That's one great peeved baby that you drew there! But the highlight for me is the man's face -- it's so expressive. SO enthusiastic! He really sells the joke for me. Yeah, his enthusiasm and joy is pretty funny. I was wondering if I needed to have his mouth open as if to show him talking. Do you think one must draw the talker's mouth open? Also, I did consider flipping him horizontally so that his back was to the the woman and baby. I thought doing so might emphasize how totally oblivious the man is, but by keeping it the way you see above, it's got a pleasing sort of pair of parentheses look as opposed to one character looking or facing out of the frame which might be weird. I don't think you need his mouth open. I didn't even notice that it wasn't. I guess it seems like he just finished talking. Having him turned away from his family would have made him seem more obsessive, but then you maybe would have had to make his face more extreme and have him underlit by the plants and... then you've got a whole different cartoon. I think the composition is really strong. My eye was effortlessly drawn from the man's enthusiasm to his wife and baby's angry expressions -- perfect! I just noticed how my eye goes from the left most stem of flowers, down to the box of plants and then up the right hand flower stem and stops at the mother. Interesting. And, going back to the baby... your very first sketch was hilarious. I like those angry eyes and the pacifier is actually denting in his face. Even your rejects are great on this one!